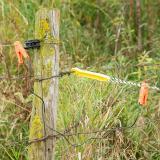 Used to secure the leading end of twine, rope or tape to an existing fence (woven, barbed and high-tensile wire) at the end of fence farthest from a reel. Attach the conductor to be terminated into closed loop end of the conductor hook. 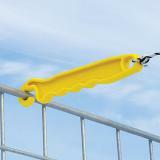 Attach hook end to any type of existing fence. I like this type better than the ones with the metal insert, they seem to wear easier on polywire. These are always handy to have around. 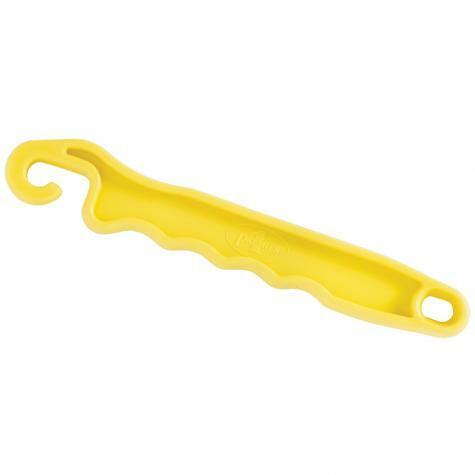 They work great for attaching polywire to existing barb or woven wire. Combine them with the conducting clips and I can make my own gate with them.